OpenStack is, undoubtedly, a really huge ecosystem of cooperative services. 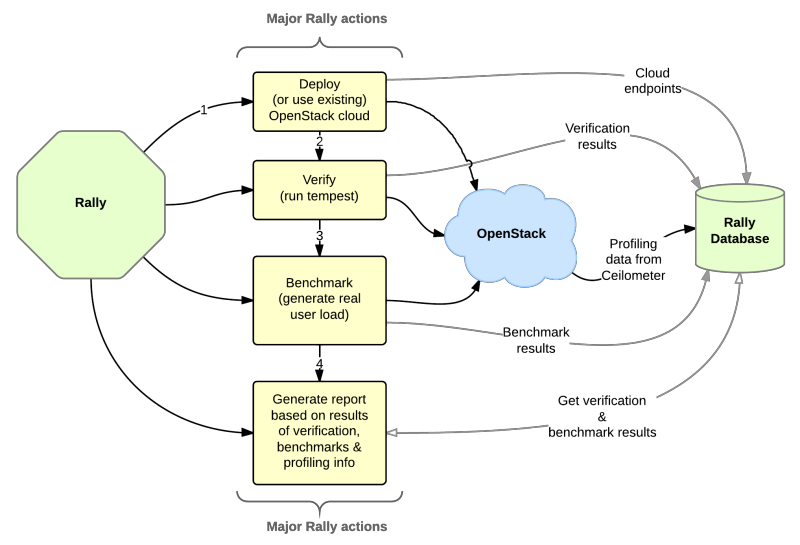 Rally is a benchmarking tool that answers the question: "How does OpenStack work at scale?". To make this possible, Rally automates and unifies multi-node OpenStack deployment, cloud verification, benchmarking & profiling. Rally does it in a generic way, making it possible to check whether OpenStack is going to work well on, say, a 1k-servers installation under high load. Thus it can be used as a basic tool for an OpenStack CI/CD system that would continuously improve its SLA, performance and stability. Where can I discuss and propose changes? © Copyright 2016, OpenStack Foundation. Revision b6a203d9.